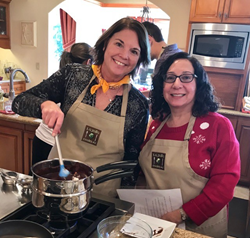 Nothing brings a team together like cooking and eating does, which is why Lajollacooks4u’s team-building cooking classes have become so popular. Cooking appeals to companies because it encourages a range of healthy activities that can translate into the workplace, such as group interaction, team cohesion, collaboration and decision-making skills. It’s also appealing in that everyone – no matter their culinary ability – can participate. No one knows this better than Lajollacooks4u, San Diego’s premiere team-building and cooking events company. Each corporate cooking event begins as participants are split into groups using various ice breakers and interactive games. From there, group members are then divided into teams and guided by Lajollacooks4u staff as they compete against each other in creating several different menu items. Participants are judged by taste, presentation and teamwork, and ultimately compete to be the team with the most points. There is even a marketing “infomercial” component, which entails each team collaborating on how to best “sell” their menu item to the judges. Once all teams have completed their recipes, participants reconvene to enjoy the gourmet meals they co-produced, a tasty reward for a job well done. Throughout the event, bonds are strengthened with one another, as employees learn how to better interact, collaborate and have fun. And these bonds can carry over from the kitchen to the office, enabling problem-solving, improved collaboration and increased productivity within the organization. Participants also prepare some delicious food, all of which feature gourmet farm-to-table California cuisine. Some of Lajollacooks4u’s most popular team-building recipes include Homemade Focaccia, Pizza Rolls, Puff Pastry Tarts with Caramelized Onions, Pears, Figs & Gorgonzola, Wild Mushroom Farro with Mascarpone, Chocolate Melting Cakes and Key Lime & Mudslide Shooters.